Tactical Trekker deals mainly with gear and techniques to help you to "Do it right. Don't Die." But human and legislative stupidity often serves up their own remarkable examples on how to "Do it Wrong. Die" ... or cause suffering and calamity. Because of that, I can't ignore the following convergence of stupidity, negligence, political correctness and a stealth gun-control law in ... yep, the Golden Granola Republic. First of all, target shooting in an area of dry brush or forest is simply stupid and clueless. How ignorant or negligent do you need to be not to know that: gun + bullet + trigger = fire. Not only that, but the Rim Fire headline reflects the anti-hunting lobby's eagerness to make hunters look bad. This may or may not have been a bow hunter. No matter. This is deep dumb sh** (DDS) territory. But there's still plenty of DDS to go around. The full study is worth reading, but this shows that steel and copper bullets can cause more fires. Lead rarely and only if jacketed by steel or copper. 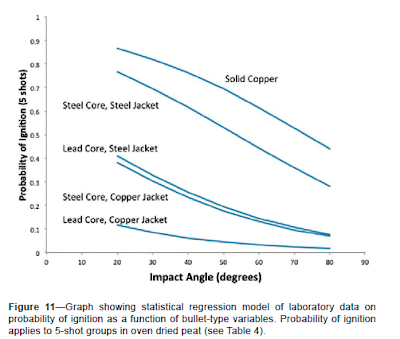 From the report: "Bullet materials clearly affect ignition potential, with steel components and solid copper having the greatest chance of producing hot fragments. We observed only one ignition from lead-core copper jacketed bullets. " Pure lead is not on the chart because it doesn't spark. STEALTH WAY TO OUTLAW BULLETS? It seems likely that the lead-bullet ban is a sneaky, dangerous and intellectually dishonest maneuver to impose defacto gun control by making it harder and more expensive to buy ammo. While there's no excuse for DDS on the part of hunters, campers or target shooters to prevent fires, there is even less excuse for California legislators to ignore the best possible data (above). Of course, political correctness never really has much room for facts and data.